Ferguson Activists Hope That Momentum Sparks A National Movement Leaders of what some call a new civil rights struggle say the protests must lead to long-term strategies. The goal is to sustain a national movement and to get past challenging obstacles. Ferguson activists march through downtown St. Louis during a protest last month. 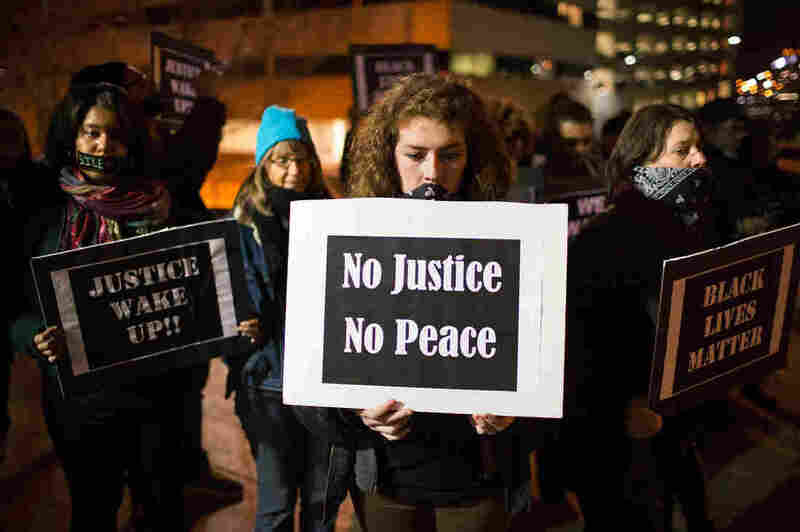 Since August, several U.S cities have been at the center of protests about policing and race. Activists in Ferguson, Mo., demonstrated for months in the aftermath of the shooting death of Michael Brown, a black, unarmed 18-year-old killed by a white police officer last summer. They also have demanded resignations and pushed for new laws in what organizers say is the start of a national movement for justice. On a crisp, sunny Saturday afternoon, about 100 people gathered at a school next door to Greater St. Mark Family Church in Ferguson. 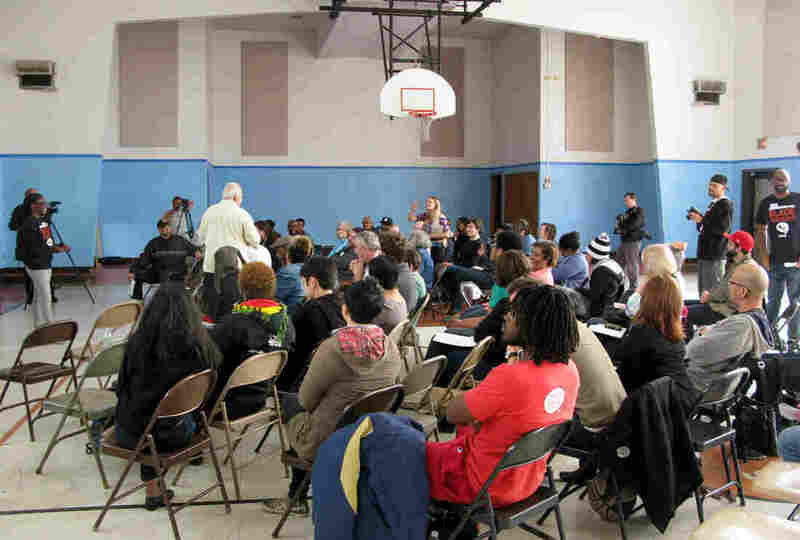 The church has been a gathering spot and safe haven for activists in the St. Louis region. "The responses that we've seen over the last seven months wouldn't have happened without you actually being willing to be in the streets, without you being willing to be intentionally involved in movement-building," says 41-year-old Montague Simmons, head of the Organization for Black Struggle. It was one of the main groups coordinating protests in the aftermath of Brown's death. "It's hard to reconcile the idea that in death, there is something being born out of it," he says. "But they left him on the ground just long enough that his blood gave birth to something else, so that we can actually transform this predicament we find ourselves in." The Organization for Black Struggle has been active in the area for several years, but other groups sprang up last summer, including the Don't Shoot Coalition, a collection of about 50 activist groups. Co-chair Michael T. McPhearson says the coalition is working to keep a national spotlight on the issue of policing in communities of color. He acknowledges there are struggles regarding coordination, funding and internal disputes, but says there's a lesson to be learned from the movement of more than 50 years ago. "If you look at the civil rights movement — and we tend to romanticize the civil rights movement — it took over a decade for it to manifest the outcomes it was looking for," he says. "It didn't just happen. It wasn't like a six-month thing and then it was, you know, we got all the civil rights that we're still fighting for right now." "During those eras you had communities, and usually faith communities, that came together to provide housing needs, to provide food, to provide transportation, to help support and create an infrastructure for movement-building," he says. "That stuff doesn't exist anymore — definitely not the same way." So now, Simmons says, activists are working to rebuild a movement while also trying to create an infrastructure for organizing — that's the hard work that comes after the high octane energy of street protests. Activist and hip-hop artist Tef Poe, co-founder of Hands Up United, says there are questions about persuading some street protesters to work with more structure. "For us, that is a struggle," he says. "For the most part everyone is a rebel amongst rebels." Still, Tef Poe says national coordination helped keep the movement going, including in New York City in the protests regarding the death of Eric Garner, an unarmed black man who died after police used a chokehold on him during an arrest. "Police brutality — it's at the point now where it's too far gone in the black community," he says. "It has to be addressed." Brittany Ferrell, co-founder of Millennial Activists United, says that while its important for activists to stay in the streets protesting, young people should also raise their voices in the traditional political arena. Ferrell points to the nearly all-white city leadership and police force in predominantly black Ferguson as a concern. "We need to be in positions of power and have a say in our spaces," she says. Ferrell says she and other activists with her group have spoken at high schools and will work this summer to launch a political workshop series for young people "to ready them potentially for running for candidates in their neighborhoods, like aldermen and mayor, and what that means, and what your responsibilities would be and 'this is why' you should do it," she says. These activists say the national focus on policing — and the Department of Justice report blasting Ferguson's police department for widespread racial bias — has brought some change, resignations of top city officials and more minority candidates running for local office. They also say they plan to keep the momentum going to make certain their movement brings about lasting change.